If you tuned into last month’s Employer Branding 101: No Really, What Is Employer Brand and Why Should I Care? webinar, you learned what it means for an organization to have an employer brand and the importance behind developing a strategy. This month we take a deeper dive into how candidates are learning about your employer brand and how to build tactics to strengthen and expand brand awareness. Talent acquisition professionals returned for the second and final installment of our webinar series, “Employer Branding 201: There Are Only 12 Ways to Communicate Your Employer Brand (Do You Know Them All? ),” led by James Ellis, (@TheWarforTalent) host of The Talent Cast Podcast and a leader in recruitment marketing and employer branding. To help recap the webinar, we’ve highlighted five of the 12 ways to communicate your employer brand and how each approach affects your organization. 1. Friend/Network/Word of Mouth: Do I Know Someone? Today we rely heavily on consumer review sites like Yelp and TripAdvisor. These platforms help us decide where to eat, shop and even receive care from a (hopefully) highly-rated medical professional. Through the years, the growing influence of online and offline “word of mouth” has reshaped the job market. In the webinar, James reminds us how employer perception can be shaped in casual conversations and reach potential passive job seekers: Imagine you’re having dinner with a friend and they start complaining about their work day and how they struggle to maintain a work/life balance. Whether you’re actively searching for a job or not, would you ever consider working there? Probably not. You’ve now formed a bad perception of this organization without researching the company itself. As Jennifer (@recruiterjenc) tweeted during our #talkHR webinar, candidates are 50% less likely to work for a company in which they have a negative impression. The experience your employees have with your organization can have a high impact on the perception their circle of family and friends have about your brand. This is because the level of trust placed on the word of personal acquaintance is often ranked above the trust on the word of the company they represent, and in the age of peer reviews and social networking, trust is a prime currency. James reminds us that to effectively communicate your employer brand you must first start with the happiness of your employees so they can become your best brand advocate. 2. Recruiter Outreach: What Was The Recruiter Like? One of the first impressions a candidate may have with your organization could be with your recruiter. If the candidate has no other recollection with your brand, the email or cold call has a high impact on how they perceive your brand. This makes it very important for a recruiter’s first touch to be personal. James recommends for recruiters to refrain from inundating candidates with emails or cold calls and have the most current information on hand before contacting candidates. 3.Social/Facebook/Glassdoor/LinkedIn: What Am I Absorbing? Once a passive job seeker shifts into an active job seeker one of the ways they learn about a company’s employer brand is through their social networks like Facebook, LinkedIn, and Glassdoor. Using social outlets to communicate your employer brand helps paint the picture for candidates while they’re researching your open positions. As James mentions in the webinar, the messages you post on your social networks should be validating interest instead of driving awareness. 4. Recruiter/Process: What Was My Experience? Another way to communicate a positive employer brand is through your recruiting process. Keeping candidates updated throughout your hiring process gives the candidate a sense of importance and makes them feel like their time is valued. Whereas a lack of communication will negatively affect your employer brand and candidates are 3.5x less likely to re-apply to your company. As Rekroot (@rekrootllc) mentions, put yourself in a candidate’s shoes and treat them as you’d like to be treated. 5. Hiring Manager: What Did I Think Of The Boss? 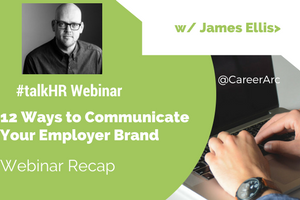 According to James, this is one of the most crucial ways your employer brand can be communicated. 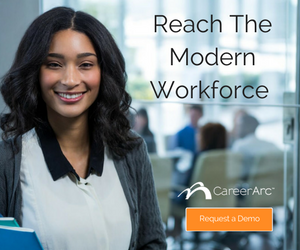 Your hiring manager can sway your candidate’s entire impression of your organization and in just one meeting. can shift their perception one way or the other. Making hiring managers aware of the feedback so far from candidates (be it through online review sites or internal candidate surveys) is one way to inform them of how a job interview can not only leave an impression on the candidate in the room but also to future job candidates who research the company in their job search. Hiring managers who understand the company’s employer branding message are best equipped to deliver that message to prospective candidates. Want the full list of 12 ways to communicate your brand? Download our Employer Branding 201 webinar now. Discover how candidates are learning about your employer brand and how to build tactics to strengthen and expand brand awareness.